Never called Greta, forever Garbo. Endlessly imitated but never matched. She was a great actress, but had something more. It wasn’t her form. She was tall and awkward. Her large feet were a Hollywood joke. Was it her air of mystery? Her rejection of celebrity? Her revolutionary sense of style? Let’s start at the beginning. 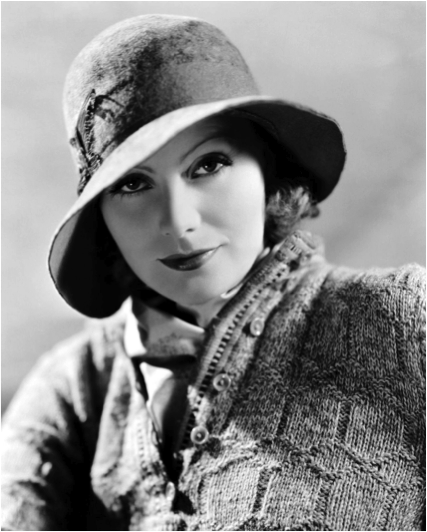 Born in Sweden in 1905, Garbo signed with MGM studios at 20 years old, uprooting to Hollywood, and soon becoming the premier star of American silent film. When the silents were shunted out by the talkie, Garbo found hereself in the same predicament as Jean Dujardin’s character from The Artist. Nevertheless, audiences adored her accented voice and her success continued until she fled Hollywood in 1940. “I want to be left alone.”. This line from Garbo’s film, Grand Hotel, became the mantra for her life. She wanted privacy, believing that her life was her own business. She rarely appeared in public and never gave interviews. This exasperated the media and her fans, her mystique only increasing obsession. In these days of Internet and reality TV, the reclusive Garbo sounds extremely refreshing. A large part of Garbo’s appeal was her androgyny. At odds with her feminine face, Garbo had a lanky form, manish gait, and deep voice, accompanied by a particularly masculine style in a time when ladylike gowns and skirts were vogue While she appeared on the silver screen in glittering gowns, her signature off-screen look was slacks, men’s-style shirts, tailored jackets, and flats. I am coining the word mandrogynous to describe her mostly masculine style. A fashion designer once told her to dress for herself and never mind what others thought, advice that Garbo took to heart. She was the pioneer in America for women’s pants. Marlene Dietrich and Katherine Hepburn? Both imitators of Garbo. A true trendsetter, her favorite chapeau, a slouchy fedora, was named the Garbo hat. Don’t forget the shoes. She preferred flats in a time when women only wore heels. She befriended Salvatore Ferragamo, who custom-made her over 70 pairs of shoes. I suspect having a movie-star salary was handy at such times. The trench coat was another men’s-wear style she popularized. She was the modern innovator for the androgynous style, setting trends that surfaced a decade later in the 1940s. Through Garbo’s disregard for others’ opinions, she changed the course of fashion. We ladies might still be wearing skirts and pumps everyday if not for her. She partially inspired Yves Saint Laurent’s iconic le smoking from 1966. Compared to Garbo, Diane Keaton had a similar style circa 1985 (think Annie Hall). 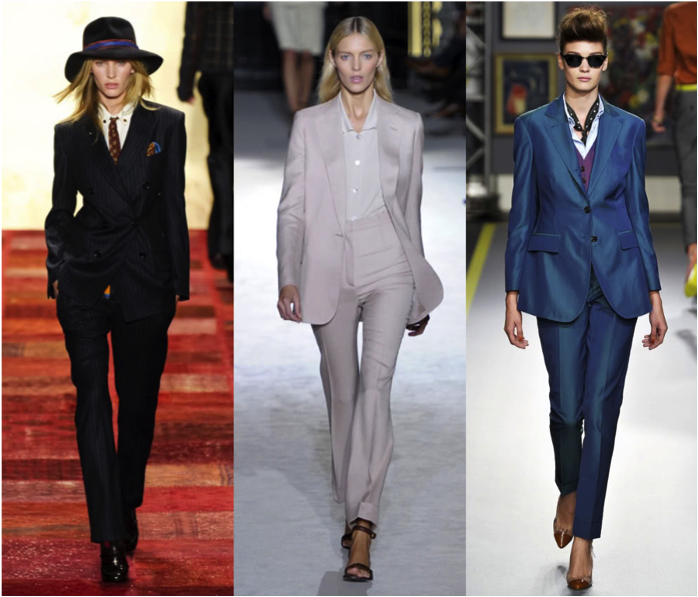 From full-out menswear ensembles from designers like Stella McCartney to individual pieces like men’s shirts or oxfords, Garbo’s androgynous, tailored-chic influence is everywhere. If Garbo were giving us fashion advice, she wouldn’t say dress just like her. She would tell you to not bother with trends, to wear what makes you comfortable and confident. Mandrogynous or feminine, Garbo would approve as long as you make it your own. Though fashion may seem separate from anything scientific, it is actually one of the easiest ways to study and learn about individuals. Not to mention, it is free; all it takes is observing and comparing individuals to one another. In this first picture, I’m sure most of you know the setting, time, and place of its taking. Upon Kate Middleton’s engagement to Prince William in 2010, she opted for a simple yet classic navy wrap dress by her favorite brand Issa. After Kate’s engagement, the London-based fashion label faced demand so huge that it almost hurt the company, Issa chairwoman told Vogue. Unlike Zara or H&M, the company didn’t have the overhead, materials, and staff to match the sudden skyrocketed demand. This scenario, and the Kate-effect in particular, is an example of the trickle-down theory. There will always be someone to imitate the upper class. We saw this same phenomenon with Princess Dianna, Jackie O, and many other famed women; we want exactly what they have. If the Issa dress worn by Kate Middleton was out of your price range, rest assured that our first lady may be your girl. When hearing about reverse ostentation, I immediately thought of Michelle Obama. I have read countless times in different sources this lady’s love for affordable clothes. Yes, she can afford to wear expensive clothes and designers would love that. But, this woman of power chooses to dress down in price, and according to the codes of reverse ostentation, this must be the thing to do. And it is. Today, the American who scores the best bargain is applauded. People proudly say “Forever 21!” in response to “what a beautiful dress!Like Bill Gates and Steve Jobbs, Michelle Obama has a love for affordable fashion even when she doesn’t have to. Like many of ours, Michelle’s favorites include Gap, JCrew, Zara, White House Black Market, and Target. There you have it. From theory to reality, fashion has existed since the beginning and will continue to exist so long as people wear clothes. In fact, one English author wrote (in the 1700’s) that “fashion is the science of appearance, and it inspires one with the desire to seem rather than to be” (thinkexist, 2013).